Wayfinding Academy student Austin Louis attended TED, the most inspiring and influential conference on the planet! This is his story. I went to TED. Yes, that’s right - the TED. The big TED. Yes, that one, the one in Vancouver, BC, and now I’m faced with the impossible task of trying to summarize this experience in a newsletter for y’all… Wish me luck. The theme this year was "The Age of Amazement." And it was truly amazing, but amazing isn’t always all good. Amazing can be scary. Amazing can be joyful. Amazing can be lots of things, and TED was certainly lots and lots of things: incredible, exhilarating, invigorating, scary, terrifying, shocking, and overwhelming. 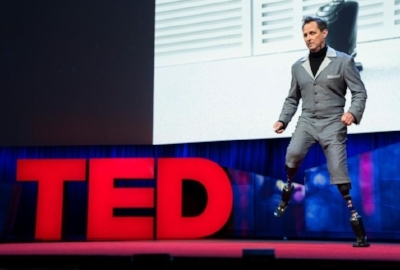 When I first arrived at TED, my excitement dwindled as a wave of insecurity crashed over me. I felt as if they had mistakenly handed me a ticket--like I had snuck into the event and they hadn’t yet discovered their error and would soon yank me out. I felt like I didn’t belong, like I didn’t deserve to be there. I’m no CEO, I told myself. I’m just a student. What do I have to offer? I’m not interesting. I haven’t done anything yet. I’ll never measure up to any of these people. So many deserving people didn’t get to come to this event because I’m hogging a seat. Austin and OK Go's Tim Norwind discussing the fun of making music. Well, it turns out this is totally normal for first-time TED attendees, and it even has a name. "You just have TED imposter syndrome," I was assured by my new friends, all TED veterans. "You'll get over it in no time." They were right. Most everybody at TED hates the “What do you do?” kinds of questions. So do I. These questions are more about sizing each other up than looking to make a genuine connection. So, luckily, I didn’t have to answer questions like these too often. In fact, I fit right in with my Wayfinding line of questioning. You know, questions like: Who do you want to be when you grow up? What do you most regret during your life? What’s the best part of your day? What advice would you give yourself at age 22? All the good stuff. I made tons of new friends. I connected with people over the things I’m interested in, things like redefining what it means to be a man in today’s world, reclaiming play as essential for adult learning, understanding shame and its role in forming our identities. I also got to talk to neuropsychologists and Grammy-award winning producers and angel investors and AI enthusiasts. So, what did I learn? A question at the top of my mind throughout the conference was, what makes us human? What makes us any different than the technology that impersonates us and automates our jobs, our relationships, our conversations, and even our arts? What makes humans unique? This was a question I kept clinging to because I had to hope that there was something that indeed made us different. I had to believe that I’d find an answer because it was too terrifying not to imagine that there’s still some irreplaceable quality we share as humans. I’m concerned about the state of the world as it is - with the environment struggling to keep up with the demands of production and consumption, with the human rights violations around the globe, with the systems of oppression in our own country and abroad, and with the profound disconnection that technology has ushered in along with its advancements and promises to make the world a better place. Empathy. My TED takeaway is that true empathy will never be automated, that being human and connecting with other humans in a real way is essential. People need people. We are social animals. We need each other. And we need purpose--and connection, and love, and community. Empathy contains the power to create change; it’s what makes us human, it can never be truly replaced, and this type of work is needed now more than ever. At Wayfinding, I’ve been exploring empathy in a multitude of ways. Whether it’s my schoolwork around masculinity, shame, and identity; my independent study on scrappiness as a practice to connect to our physical world and our ancestors; or my passion for play and its effects on adult learning--my TED takeaway reassures me that this work can never truly be replaced. And this type of work is needed now more than ever before. In this first month of Term 3 (and the last term of Year 1! ), students started internships and working on pretty awesome projects. Elizabeth, a member of the inaugural cohort of students, was one of 15 people who went on Wayfinding Academy's first ever Learn & Explore trip to walk the Camino de Santiago pilgrimage in April 2017. Not only was Elizabeth a participant, she was also the trip leader for one of the two routes explored during the 15-day journey on foot. In this week's newsletter, Elizabeth shares how the experience was more than just walking for 250+ miles. For the past few months, the Wayfinding Academy has been working on a new video to help us tell our story to the world, and gather new people into our movement. It's about the power of maybe. From the early days of Wayfinding, we've been fortunate to have a curious, supportive, and enthusiastic group of followers. We sent the video to them first (Not on our mailing list? Sign up here) and now we're sharing it on our blog. "The seeds of the DFSS were actually planted in Term One as a bunch of us got together to discuss creative ways to pay for college. This discussion quickly transitioned into one about the greater problem of student debt in this country, and our desire to try to do something about it..."
The Wayfinding Way is to approach everything with intention and care for community. "We are Humans to be Cultivated" - Sneak peek into our application! Curious about what goes on inside our classroom? Faculty member David Rikert gives us a closer look at the core course, Engaging with Information. It’s hard to believe, but our March 10th priority deadline for Cohort 2 is fast approaching and we’ve started to review applications! This next cohort will join us as we continue laying the foundation for something truly special at Wayfinding Academy. On February 17, 2015 I booked a hotel room in my hometown of Portland, Oregon (a thing I do a few times per year when I have a big project I need to focus on) and submitted the official legal documents to bring the Wayfinding Academy into existence. There have been many momentous days in the past two years since I officially started my own college, but February 17th will always have a special place in our history (and in the IRS database of non-profit organizations).